Save planning time: Schemes of work, lesson plans and PowerPoint presentations help tutors make the most of their planning time — they can be used as they stand or edited to suit tutors' needs. Inspirational lesson ideas: A variety of activities for use with assignments - or as a starter stimulus for group discussion - to support and stretch learners. Tutors can photocopy them as many times as needed. 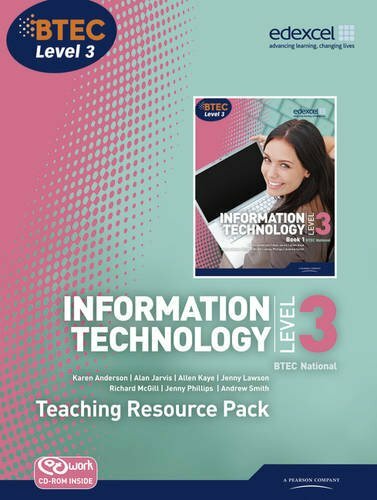 It’s easy to update your VLE with BTEC resources: All schemes of work, lesson plans and activity sheets are stored on a FREE VLE disk in the Teaching Resource Pack, so tutors can transfer whatever they need onto their VLE in just a couple of easy steps. Engage-Stimulate-Motivate with @t work interactive activities and video case studies featuring industry professionals, to motivate learners and help keep lessons lively and up to date. All the help tutors need: with support for delivering the new specification and new materials to support learners through Pass, Merit and Distinction, so tutors are supported every step of the way to achieving BTEC success.